Using an accessible question-and-answer format, this short but focused book tackles themes relating to the etheric - or life - realm. What is etheric technology? What are the impacts of radioactivity and atomic energy? How should we read apocalyptic symptoms in science and society? 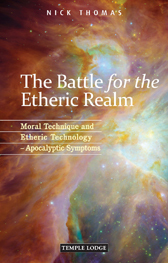 In a fascinating series of discussions Nick Thomas examines a range of concepts, including: the right and wrong ways to develop an etheric technology; spiritual events in the etheric realm; how the physical world works into the etheric world and vice versa; Rudolf Steiner's "Strader machine"; the nature of truth and lies; attacks by the adversaries on forces of vitality; and humanity's crossing of the threshold to the spiritual world. His explanations and ideas help to evoke a living picture of a great struggle between forces of good and evil, with the future of humanity and the Earth at stake. NICK THOMAS trained as an electrical engineer in the Royal Air Force, serving as an officer for 16 years, and later worked in data communications for Nortel. He was General Secretary of the Anthroposophical Society in Great Britain for 21 years, and researched the practical application of projective geometry with colleagues Lawrence Edwards and John Wilkes. His major research interest is the development and application of Steiner's discovery of negative space, with the aim of building a bridge between conventional and spiritual science. He lectures widely on this and other subjects, and is the author of Science Between Space and Counterspace and Space and Counterspace.